Jenevier is a healer. It’s her family legacy… and with the recent death of her aunt, it is now her duty. Yet when the brutally handsome Prince of Wrothdem marks her to be taken by his slave wraiths, her intended destiny is irrecoverably altered. With the unyielding help of her lifelong friend–and the chivalrous support of a valiant young man–Jenevier discovers the cryptic clues her aunt kept hidden away amongst her secret treasures. Forced to overcome her village-mouse naivety, this tiny young woman sets out to change her fate. Armed with nothing more than the single name of a needed stranger, Jenevier begins a solitary journey of epic proportions. Alas, the curious new world she haplessly traipses into turns out to be nothing like the celestial realms described in fairytale stories. She soon realizes that the life of servitude and submission she was running away from… it may just be the lesser of two evils. Emerging from her torturous trials a completely new creature, the once-gentle young woman who used to smile and giggle too much now eagerly awaits the bloody day she can viciously free herself from the Prince’s dark curse. Abandoning an epic love unmatched throughout antiquity, Jenevier faces down the tyrannical claimer of innocence and passes a righteous judgement upon the gorgeous Prince she hates above all creatures. Yet, was it vengeance or justice? Will Jenevier’s gruesome decision free the terrified women of Ashgard, or send the entire universe into heretofore unimaginable chaos? Love and curses, freedom and sacrifice–unlike you’ve ever heard it told before. Is good always good? Is evil always evil? For you must know this, Brothers and Sisters… Every curse has a blessing and every blessing has a curse. When you stand face to face with your destiny, will you be able to tell one from the other? The past is seldom as we’d have it and the future is too uncertain a thing. Embrace the here and now. Make the most of today, it’s all you have, all you can trust in… and that’s exactly what Jenevier was trying to do. Her mistakes were behind her, along with her bloody past. She wasn’t even certain if she had a future anymore. She simply lived each day as it came. Jenevier had bargained with God – tried to reverse the sun, erase her murderous crime. Alas, you must be certain you can pay the price before the bartering begins. Yet, what do you do when your life is just one big long string of bad decisions? You grow and move forward, determined your future won’t mirror your past. Or… you change nothing. You just keep doing what you’ve always done until you stagnate and die. Either way, the decision is yours alone to make. After wrongfully killing Merodach, Jenevier trades her soul for his life and wakes up all alone in a strange new world. She must pay the price, learn her lesson, and discover her intended blessing before she can start over. Yet, along with her epiphany, she’ll find a whole new realm complete with its own set of problems. There is no perfect place in this universe because we are not perfect creatures. No matter where you find yourself, there you are. If you step into paradise dragging all your tainted and scarred baggage with you, then it’s no longer paradise. Your flawed heart removes the bliss, negates utopia. Home was all she longed for, all she dreamed of… but was her home, her past, a place she could run to? Or would she find it was the one place she wanted to run from? Swapping her mantle of ultimate celestial power for the miraculous blessing of a beloved child, Jenevier no longer wields the ethereal mask of Life and Death. Trading Netherhood for Motherhood, her quiet days are now filled with the blissful thoughts of a fairytale family and an unmatched joy… the likes of which she never dreamed possible. The fractured love she shares with Varick has stood firm through the test of the ages. They have walked through the fires together and emerged, not unscathed, but gloriously scarred… Their trials and pain have only managed to strengthen their eternal bond. But when Fate rolls the dice once more, will the former Angel of Death be strong enough to meet the awesome challenge? Will she be able to see through the debilitating pain of loss, wipe away the bitter tears of betrayal, and grasp the incredible Blessing awaiting her? Or has extreme adversity left her too shattered and broken to fight back? Continue along with this epic tale of blood and battle amongst the Otherworld’s Blessed and Damned in the series third installment of JK Ensley’s, A Dance with Destiny: Enthroned by Amethysts. After surviving an epic battle, an epic betrayal, and a heart-shattering epic loss, Jenevier is still reeling from the devastating pain. Setting the universe back to rights and calming the chaos left in the wake of her dark husband’s wrath is all that’s keeping her tormented soul from crumbling into tiny, irrecoverable pieces. Ashgard—the land of layer four, home of her youth—she returns there with a glimmer of hope pleading loudly within her heart. If her dearest friend Jezreel yet lives… perhaps it will give her the needed strength to go on. Blissfully, Fate chooses to finally smile upon the tiny Angel of Death when she finds not only her beloved childhood friend alive and well, but her handsome emerald-eyed first love is lying fast asleep in her old feather bed. With Alastyn by her side and Jezreel now happily wed to the elegant Elven Prince, Jenevier lets the immense joy of their long overdue reunion wash over her. Caught up in the euphoria of charmed love and amazing new revelations, she never sees the treacherous onyx-eyed little devil lurking about the ancient trees of Mangladune… until it’s too late. Follow Jenevier Olesia Embarr as she continues upon the twisted path that is her magical life in the fourth installment of JK Ensley’s A Dance with Destiny, where every curse has a blessing, and every blessing has a curse. As it should be. Settling in with life at the palace, Jenevier is content in her role as Empress of Jinn. The near constant summonses have become commonplace, and Daichi is ever ready to heal her the moment she returns. Not only is she Guardian of Dragons and Mother of Angels, she is also the proud grandmother of Tenshi’s tiny raven-curled little girl, Lala. All in all, life is good. When the summons comes down to go to Earth, Jenevier doesn’t bat a lash… until Uriel says he is to accompany her. Nothing good ever happens when one of the Archs shows up at her door. Then again, she has never faced a trial quite like this one. Jenevier had oft been warned… A single mistake upon the eighth layer can cause unfathomable consequences. She soon learns the painful truth in those words—choosing to go against Uriel’s wise counsel proves tragic. Finding herself with no one else she can turn to, Jenevier joins with her bonded Dragon, Nilakanta, and heads back to the realm of Earth in hopes of mending what she inadvertently rent. Minus her wings and her claws, she vows to do the impossible. Alas, the situation proves just that… impossible. In her darkest hour—absent friends and minus hope—Jenevier finds a surprising ally in the most unlikely of all Angels. Will her new savior help bring peace back to Earth… or will he rain hell down upon it? 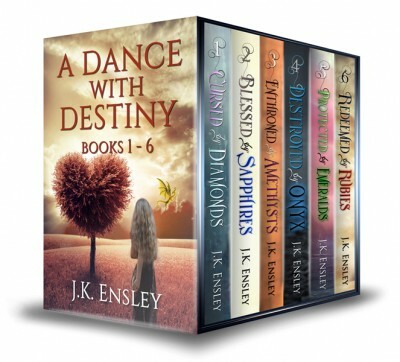 Join Jenevier’s latest magical adventure as the tiny Grim Reaper tries to save this world as we know it in book five of JK Ensley’s epic fantasy series, A Dance with Destiny. She is truly the Angel of Death. As it should be. The final installment in the A Dance with Destiny series. An epic conclusion to an epic fantasy tale.